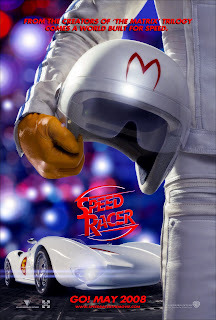 I recently watched the film Speed Racer by the Wachowski brothers. Imagine my surprise that I really enjoyed the film! Overall, I think that the stunning visuals and bright colors, coupled with good to excellent acting force me to give this movie a bit of a pass as far as physics goes. But there was one scene that made me wonder if, even given the magical properties of car and driver, would be possible. The scene in question takes place during a cross country race, which Speed has engaged in so that he might help the government with some investigations. At one point during the race, Speed's car is forced off the track! Not one to be stopped by a little setback like being forced down a cliff, he drives his car back up a nearly sheer cliff face! The question is, could even the Mach 5 have been able to achieve such a feat? The answer should be no, probably not, but that would be boring. To find this answer though, we need to know two things. One, what is the primary force driving the car, and the second, what is the maximum force output that it's capable of. The answer to both questions can be found in how the car drives around normal turns. In the movie, they state that the speed of the vehicles driving around the track is "800 km/h." We'll assume that this is a high end as we use this number to allow us to approximate the speed at which he goes around the turns. I'll guess he's going about half his maximum speed when taking the tight hairpin turns. If we assume that the Mach 5 can take a 10 meter radius turn at about 400 km/h, which is reasonable given what we see, then what would the acceleration be to keep him in the turn? Using the equation V^2/r, you find that the centripetal acceleration would be on the order of 200g. Notwithstanding that no human could survive that level of acceleration, this would at least be possible given a car made out of unobtainium and some magical drive system. It does tell us one important thing though: the primary motive system for the car is not the motors driving the wheels, but the thruster at the back of the car. To see why this is you need only look at how tires function. Tires rely on frictional forces between themselves and the road to provide the force on the car. The equation that describes this force is mu*normal force * gravity, where the normal force is the weight of the car and mu is what is known as the coefficient of friction. To provide the 200g's required, mu would have to be equal to 200, since the highest coefficient of friction that I could find was gecko feet, at 8, we can safely assume that this number is ridiculous. Now that we have all this, we can discuss the mountain climb. We can see clearly in this scene that the mountain is not a sheer cliff, so there would be some small force holding his wheels to the ice. Combined with the spikes on his tires, this might be enough grip to allow him to control his ascent. Now, given that the nominal acceleration of the Mach 5 is 200g, minus 1g of gravity, he can not only drive up the cliff, but drive up it at 199g. Although the overall physics of this movie is silly with respect to the car, if you give them the Mach 5, the rest is surprisingly consistent. Well done, Wachowski's. Fish, you never cease to amaze me.